Tampa students protest homophobic speaker | Fight Back! Tampa, FL - On Oct. 7, members of Tampa Bay Students for a Democratic Society (SDS) protested against Rosaria Butterfield, a self-described former “radical lesbian feminist turned pastor’s wife.” Butterfield now writes and gives lectures opposing homosexuality and advocating for evangelical Christianity. She believes that homosexuality is a sin and that her pride in being a lesbian was an even greater sin. During Butterfield’s speech at the University of South Florida (USF), nine students in the front row stood up, turned their backs to her, and revealed shirts that had pro-LGBTQ messages written on the front and back. 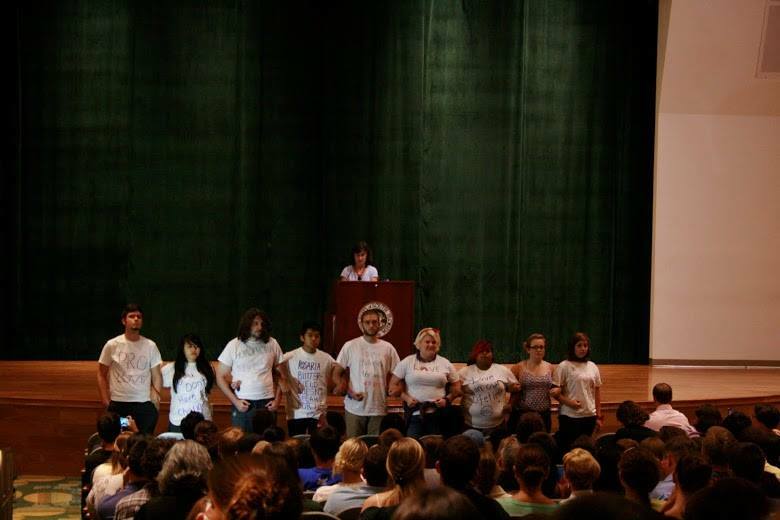 The shirts had messages such as “Hate speech is not free speech” and “Rosaria Butterfield does not speak for us”. Under the watchful guard of Tampa Police, private security and USF administrators, the protesters stood for the entirety of her speech as onlookers took pictures and gave approval to the protest act. The protesters then silently filed out of the auditorium as Butterfield called on audience members to ask questions. During the question and answer session, support for LGBTQ students, faculty and staff, and the protesters was overwhelmingly. The glaring contradictions in Butterfield’s views were apparent as audience members questioned her on her stance that both homosexuality and homophobia are sins. After the lecture, SDS joined the PRIDE Alliance and progressive students and churches in a rally. Groups set up tables to show support for the LGBTQ community and progressive causes. Expressions of support for the protest from students, faculty, staff and community members continued for days afterward.